Few facets of our society offer a better display of the depravity of capitalism than the housing industry. Recently, the Grenfell Tower tragedy killed hundreds of poor people and displaced hundreds more in London. In the United States, we have also seen the displacement of thousands, if not millions, in the wake of the financial crisis. While entire city blocks lay vacant, people sleep on the street or bounce from place to place in search of permanent housing. This is not a coincidence; the neoliberal agenda treats housing not as a fundamental right, but as a commodity. And in a city like Philadelphia, in neighborhoods like Point Breeze, the devastating effects of that commodification are on full display. Philadelphia has become a “hot” place to live, now ranked number one on lists like “Best US Cities For Young People” from “lifestyle brand” websites like Thrillist. According to the Pew Charitable Trust, the millennial population increased by about a hundred thousand from 2006 to 2012, with the highest concentration living in downtown Philadelphia, South Philly, and University City, home to Drexel University, University of Pennsylvania, and University of the Sciences. Although it’s still cheaper to rent or buy in Philly than in New York City or Washington, DC, the city has been bleeding affordable housing. Between 2000 and 2014, Philadelphia lost 23,628 rental units below $750 (a price point used as the metric for local affordable housing). And while poor Philadelphians find it increasingly difficult to find places to live, middle-class and upwardly mobile homebuyers reap the benefits of Philly’s latest development strategy, the property tax abatement. The tax abatement was implemented to encourage development in a city that has long had a reputation (in the eyes of the business community, at least) for being unfriendly to business. Long-term residents are ineligible for the tax abatement unless they do significant construction to their homes, and they bear the brunt of increased home values when they pay their property taxes, with some seeing increases as high as 1,000 percent. The city’s Office of Property Assessment analyzes recent sales of similar properties in an area to set the tax value on all homes in that area. So if, for example, someone bought a house in 1980 for $30,000, but the house next door to just sold for $500,000, the taxes on the former would shoot up — regardless of their income or the condition of their home. Since the implementation of the ten-year tax abatement in the late 1990s, the city has experienced a boom in construction which politicians and developers boast about. But since 2014, 70 percent of new construction has been unaffordable, with apartments now averaging $1,795 a month. With the highest deep poverty rate of the ten largest cities in the US, this is increase is crushing for the majority of working-class Philadelphians. This is not the first time the city has tried to incentivize developers to build affordable housing. In 2016, developer PMC Property Group was given the go-ahead to add nearly five stories to the height of a new apartment building, in exchange for providing twenty five below-market-rate units. Once the taller building was complete, PMC backed out of the deal. In exchange for forfeiting the affordable rental units, PMC gave $3.75 million to the Philadelphia Housing Trust Fund — a small price to pay to ensure that poor people don’t live among those who can afford $1,795 for a one-bedroom apartment or $5,525 for a three bedroom. Only fifteen affordable rental units have been built since the city introduced the incentive five years ago. While the median income in Philly has grown to $41,000, the poverty rate has remained about the same, at 26 percent, with the deep poverty rate at almost 13 percent. Clearly, the housing boom does not reflect any significant mobility for the poor. Described as a “seller’s market,” young upwardly mobile professionals scramble to bid on homes in “sketchy” neighborhoods minutes after they’re listed, often offering well over the asking price. According to Trulia, the price of sold homes has increased by $22,500, or 10 percent, over the last year. New construction in predominantly black, impoverished neighborhoods like Point Breeze, just south of the well-heeled Rittenhouse Square area, are often sold in the half-million-dollar price range, thanks to the ten-year tax abatement and proximity to the more elite and even more expensive neighborhoods. This explosion in construction and the increase of rent and housing can be traced to the city’s disinvestment in the neighborhood in the mid-twentieth century. Up until the 1960s, Point Breeze was a fairly diverse, safe neighborhood. Point Breeze Avenue, often referred to as “the Breeze,” was filled with thriving businesses. But as manufacturing jobs decreased and black people began to move in, white residents abandoned the neighborhood, and with them went many businesses. In the late 1970s and early 1980s, unemployment continued to rise, drugs flooded the neighborhood, and the War on Drugs came next — leaving Point Breeze, like so many other urban neighborhoods around the country, crime ridden, poor, and devastated by mass incarceration. Because of this disinvestment, Point Breeze was left with a large supply of vacant land very close to downtown Philadelphia. This allowed investors and developers to buy parcels cheaply, knowing that housing prices in a neighborhood only a mile south of downtown Philadelphia would eventually tick up. This moral compass drove him to carve out a section of Point Breeze as his very own: Newbold, which encompasses the eastern edge of the neighborhood. Longacre has defended his actions by saying the neighborhood (where he owned a bar) needed more “identity” — code words, clearly, for the identity of white, upper-middle-class residents. In addition to offering ten-year tax abatements, developers have tried, often successfully, to rebrand neighborhoods in the midst of gentrification in order to attract new, wealthier residents and to wipe the old neighborhood off the map. Residents fought back against Longacre’s proposed name change, and in 2016, the Newbold Neighbors Association voted to change the name of their civic association to East Point Breeze Neighbors. The tension between long-term and new residents is no secret in Point Breeze. 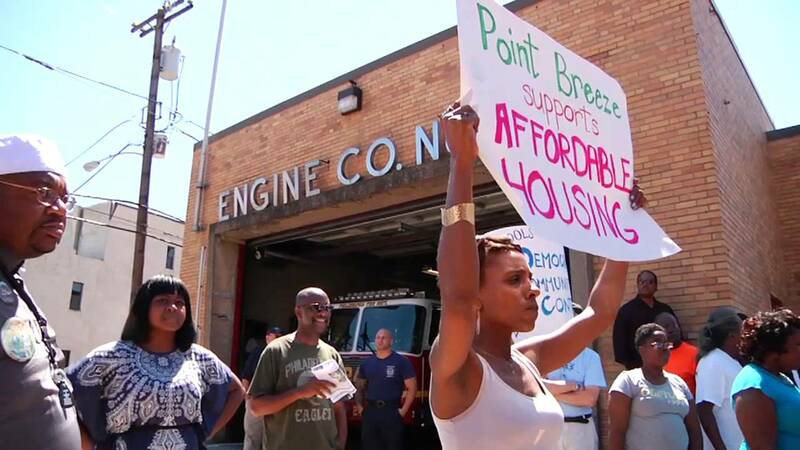 In 2011, the community organization Concerned Citizens of Point Breeze organized around a bill that would impose a one-year moratorium on construction of buildings, additions, or roof decks higher than two stories. The majority of houses in the neighborhood built before the big construction boom are two stories, and three-story homes (and roof decks) are a visual reminder of the new residents’ higher incomes and old residents’ increasing marginality in the neighborhood they’ve spent their lives in. The bill didn’t pass: then-mayor Michael Nutter was concerned that it would stifle development, depress property values, and interfere with public investment in the neighborhood. High-end development continued apace: between 2006 and 2014, Point Breeze and its northern neighbor, Graduate Hospital, saw an increase of over three thousand new roof decks. In May 2015, developer Ori Feibush ran in the City Council race for the Second District against incumbent Kenyatta Johnson. Johnson grew up in the heart of Point Breeze and represented the “old” neighborhood, Feibush the “new.” Johnson won by an almost two-to-one margin; Feibush has continued “developing” the neighborhood. Neighbors’ responses to Feibush’s development and brash attitude — who called then-city councilmember, now mayor, Jim Kenney “drunk” when he disagreed with him — have been severe. Years ago, someone left a dead dog on his doorstep; a brick was thrown through his coffee shop’s window in August 2013. In May 2017, someone set fire to two of his townhouses that were under construction. Both homes were listed for over half a million dollars. None of these actions will stop Feibush or any other developer with the means and desire to capitalize on the latest “hot” neighborhood. Thousands of people are only too eager to buy or rent these urban McMansions. But these gentrifiers aren’t the source of the increasing inequities in the housing industry, nor are they the source of the continuing displacement of the poor and working class. The ones who are pulling the strings, and who housing activists must target in their affordable-housing campaigns, are developers and politicians. While politicians and developers advertise the tax abatement as a subsidy to homebuyers, it’s actually a much larger subsidy for developers and banks. The developer makes a higher profit, and the bank makes more from interest, because the abatement allows buyers to qualify for larger mortgages. As such, developers make huge returns on their investments. Because the abatement lowers the tax portion of a homeowner’s monthly payment, it increases the house portion of the payment. Individuals looking for homes and apartments don’t set the costs of housing, of course — capitalists do, and politicians are often ready to help them bump that price higher. Although Feibush didn’t win his city council race, another developer did. Allan Domb, known as the “Condo King,” has pushed for doubling the tax abatement from ten years to twenty. The former two-time president of the Greater Philadelphia Association of Realtors continued his realty career even after his city council win in 2015, purchasing a nineteen-story office building in downtown Philadelphia for $17 million in April 2016. Domb, nodding to concerns about school funding, publicly committed to donating his $129,000 city council salary to Philly schools. Sounds noble and selfless — until one realizes that his salary is a drop in the bucket compared to the $17 million price tag, and the millions in tax revenue the city will lose from the abatement. The school district relies heavily on property taxes to fund its schools: 55 percent of them go to the district. But Philly’s property-tax base has never been adequate, and in 2013, the district closed twenty four public schools due to lack of funding. These connections are not lost on parents, teachers, and education advocates: the Philadelphia Coalition for Public Schools (PCAPS) estimates that tax abatements starved the school district of almost $50 million in 2014. Walter Smith School in Point Breeze was one of the two dozen public schools shuttered in 2013; Ori Feibush purchased it to turn it into apartments this year. In May, Feibush wrote on his Facebook page, “… [Our other neighborhood] schools need enormous help and we should be spending our collective energies fighting to improve them, not to bring back a long since shuttered school.” To “help” another community school in the neighborhood, Ori and his OCF realty team built furniture for the teachers’ lounge. Despite Feibush’s grand gestures for the Point Breeze youth, many are being displaced. Here in Philadelphia, one in fourteen renters has faced eviction. Although displacement from gentrification is less obvious here than in more expensive cities like San Francisco and New York, as rent increases, evictions will increase, too. If the minimum wage stays stagnant at $7.25, and rent continues to go up as quickly as the market allows, more poor families will be evicted. In landlord-tenant court, 92% of tenants lack legal support. While city council just recently passed legislation to invest $500,000 in legal aid for tenants in landlord-tenant court, the amount is likely far below what renters facing eviction will need. There are policy measures that city council could pass to slow the process of developers gobbling up working-class neighborhoods: eviction protections, increased funding for public housing, and rent control. But while the self-proclaimed Condo King of Philadelphia sits on city council, there is no reason to expect to see an affordable-housing boom anytime soon. Young white people who move into predominantly black neighborhoods and may serve as early catalysts for rising housing prices often talk about fighting gentrification on a very individual level. We’re told to acknowledge our privilege, say hi to our neighbors, and learn about the history of our community. But many of these suggestions are empty expressions of morality — if every white person spoke to their black neighbors, developers would still continue to buy property, fix it up, and sell it, all with help from policies like the city’s tax abatement. The ever-present racism in gentrifying black neighborhoods is abhorrent, but it’s not the only piece of the puzzle. Rent will continue to rise with or without addressing individual white residents’ fear or hatred of their black neighbors. Organizations like the Philadelphia Tenants Union offer an example that residents of neighborhoods like Point Breeze who want to put the brakes on gentrification should strive to emulate. The PTU hosts neighborhood meetings, organizes direct actions with tenants to fight back against slumlords and unfair evictions, and connects tenants with free legal counsel to assist them in landlord-tenant court. They have helped tenants win back security deposits from powerful landlords through direct action and fought off evictions in landlord-tenant court. The Penn Wynn House, home to the elderly, people with disabilities, people living with HIV/AIDS, and those who receive housing vouchers, was purchased by Cross Properties in late 2016, with the intention to redevelop it and add a pool and roof deck. With the support of the PTU, tenants demanded the return of their security deposits in full, and a promise that they can stay in their apartments until they find new housing. They pressured their district’s city councilperson, Curtis Jones, to act, and have received a verbal commitment from Cross Properties that they will not be pursuing evictions. We need to push back the tide of the redevelopment and privatization of working-class communities, and take our fight directly to the rich developers and idle city council. To win housing justice, we need a real movement. Working-class people deserve to be in charge of determining their neighborhood’s future — not developers. We can win housing justice, but the clock is ticking.